Like most people, we’re into binge-watching television series and are always looking for something interesting to watch. 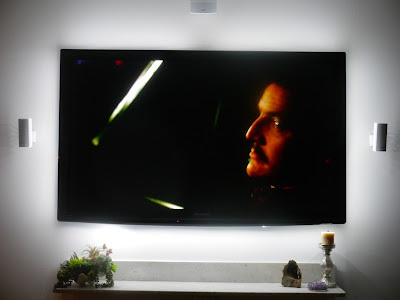 To make our viewing experience a bit better, Kevin installed this Philips Hue LightStrip around the back of the tv. This kit, along with dimming the room lights, makes the experience so much better! The blacks are blacker, and the picture just seems to pop! They’re easy to install, can be controlled with an Echo or Echo-like devise device or with the app, can be trimmed or extended (with the purchase of additional light strips) and can be used for other purposes. For people who are into watching television and tech, this kit is a gem!